Royal Wedding Photo Coincidence? I think not. Recently a picture has been circulating the internet that has warmed our hearts even more and truly made us believe that the Royal Wedding between Kate Middleton and Prince William truly was a fairytale wedding. 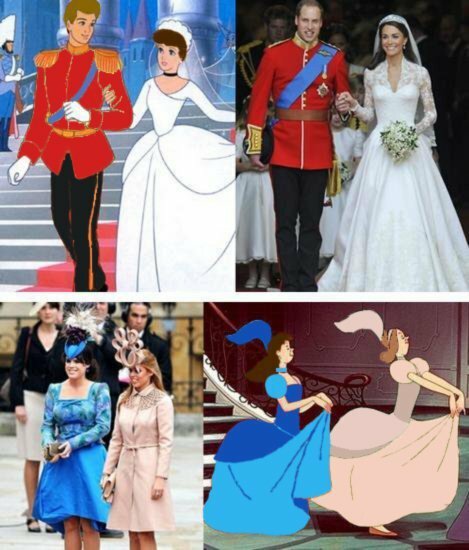 The picture below shows William and Kate next to newly-wed Disney characters and then shows Beatrice and Euginie (Fergie’s loovely daughters) next to an image of the ugly stepsisters from Cinderella. When I saw this picture I swooned. I thought wow, these two really are the fairytale couple. Then my incredible knowledge of Disney movies got the best of me. Now let it be known I do not like raining on people’s parades especially that of the love story surrounding Will’s and Kate. But all you suckers out there need to know the truth. Those pictures are fake. Let’s start with the Disney wedding that happens to look pretty much exactly like Willam and Kate. Who the hell are these two? The only brunette Disney Princess was Belle. Sometimes Sleeping Beauty looked like she had blonde hair but that is simply bad lighting – it was made in the 1950’s after all. Also, no Disney prince in history has been a member of the British Army, and if there was one that I’m missing, I highly doubt her was recently dubbed Colonel of the Irish Guards which is what allowed William to sport that handsome suit on his wedding day. This leaves us thinking that the photo must be of the one and only Cinderella. Cinderella had beautiful flowing blonde hair and did indeed marry her Prince Charming. However, after extensive research it is important to note that there is no proof that “Charming” is actually a Prince at all! In fact, the term Prince Charming is given to a man “with great attractiveness”, which I’ll give him. He is pretty hot for a cartoon. But if Prince Charming’s father dies, he will become the King of Nothing. And finally we now must take a look at Beatrice and Eugenie. Although these poor girls are much like myself and have names most commonly found in an old folks home, they showed up looking like quite the spectacles at the Royal Wedding. Again, seeing the Disney picture of these two had me SO excited because I had said they look like the Ugly Stepsisters from Cinderella from the get go. Now while they’re outfits do have a striking resemblance to Drizella and Anastasia they are not actually in fact the same colour. So today I must break the shocking news that these images circulating the internet are in fact fakes. Photoshop is a powerful tool my friends, and it has blindly lead us to believe that the Royal Nuptials were the product of a life imitating art phenomenon. Below are the two original images from the Disney movies. I will preface this by saying I have used Photoshop to resize these photos but have made no other alterations to the photos. Sorry kids. But you needed to know the truth. 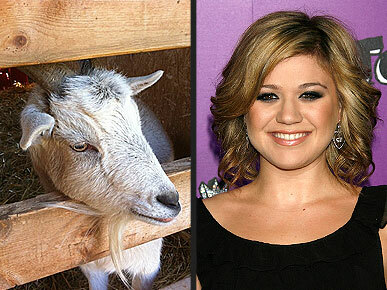 On a recent trip to the local grocer, we came across this sign advertising “Celebrity Goat Cheese”. A quick google search has lead us to believe that this is in fact false advertising as there are no living famous goats we could come across who would be producing such a product. Sure you’ve got the Billy Goats Gruff, but they are fictitious and therefore unable to produce the necessary resources to produce goat cheese. You’ve also got William Windsor. 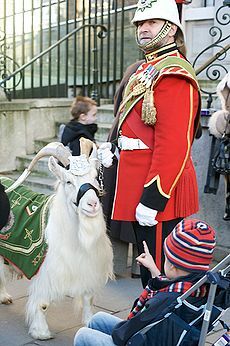 A goat who served as lance corporal in the 1st Battalion, the Royal Welsh, an infantry battalion of the British Army. Yes. A GOAT. Served in the army. Fear not. He has since retired and I’m sure has some maids brushing his beard each night. Regardless. Famous army goats would never agree to make cheese. figured she would exploit her new bearded friend and convince him that he could enter the world of fame through peoples bellies. Being the sucker that we can only assume he is, he agreed. And now his logs are being sold at a premium price. I’ll put money on the fact that that cash isn’t going to his college savings fund.